Miss Beauty Saver // A British Makeup and Beauty Blog: £0.50p Beauty Clearance Bargains from Poundworld! 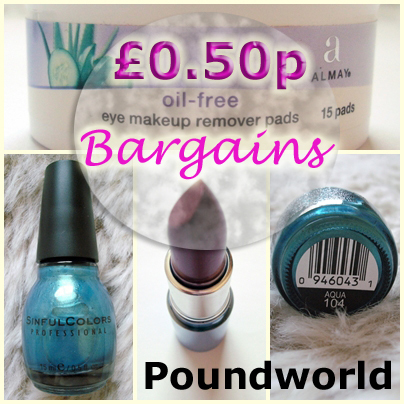 £0.50p Beauty Clearance Bargains from Poundworld! Last week, I brought you a post on the 5 lovely Rimmel Makeup items I'd purchased from Poundland for a fiver (Post Here). This week, I'm so pleased to be bringing you my latest beauty bargains, but this time they were from Poundworld (another UK Pound Shop) and they were on Clearance Sale at half price, so these three lovely items were only a mere £0.50p each! Now that's what I call a bargain! All of these products were reduced to 50p as they had come out of their original outer packaging but they were still all in good condition so I saw no reason to not snap up these little gems. The first item I picked up was a pack of 15 oil free Almay eye makeup remover pads. I was really pleased about this as Almay is currently the best selling brand of eye makeup remover in America and I've seen quite a few YouTubers rave about these! I'm really looking forward to trying these out and if I like them enough I may even repurchase them at full price. These were actually sealed on the inside of the pot, so even though they came out of their outer packaging they were still in perfect condition. The last item I found amongst the clearance makeup items in poundworld was a Nivea Colour Passion lipstick in the Shade Ruby. This had the most tiny little scuff on top of the lipstick bullet but it was really almost nothing so I decided to purchase it anyway and I'm really glad I did as the colour of this lipstick is fantastic. It's a deep ruby red and the formula feels very creamy and moisturising. It's a very pigmented lipstick and could defiantly be used as a lip stain or sheered out with lip balm as it gives such great colour payoff. So, there are my latest and greatest beauty bargains! Have you snapped up any good beauty deals recently?